There's no question that we've hit fall. My consumption of Pumpkin Spiced Latte's is on the rise, while my electricity bill has taken a nose dive. I'm thrilled about this trend; however, the savings from Entergy are already spent on several upcoming races. When it comes to quality events in the Crescent City on which to spend your registration dollar, October is where things really start to heat-up. There's a few events in this lineup that I personally plan on attending, including the Oktoberfest 5K, Gulf Coast Half Marathon, and possibly the Cane Field Classic. Two out of the three I've never experienced, and the third has countless surprise additions each year. Where will your fall racing schedule take you? Tom Sawyer Mississippi River Run 2 Miler (Friday, October 10th @ 6:30 p.m.) - A 20+ year tradition, this year's edition features a new title sponsor, cool participant shirts, cash prizes for overall winners, and cast-iron trophies for top runners. Race to the Lake 5K & 10K (Saturday, October 11th @ 8:00 a.m.) - In its second year, this race has changed course to run the paths along the shores of Lake Pontchartrain with a finish inside Treasure Fest. UNCF Walk for Education (Saturday, October 11th @ 8:30 a.m.) - The 27th annual event takes place at the Audubon Park Riverview area directly behind Audubon Park & Zoo, also known as "The Fly." Monster Dash 5K (Saturday, October 11th @ 9:00 a.m.) - Join the Cystic Fibrosis Foundation's most spooktacular event, the fifth annual Monster Dash! Everyone dressed in costume can compete for great prizes in their costume contest at the post-race party. Dirty South Marathon, Half, Relay & 5K (Sunday, October 12th @ 7:30 a.m.) - Bringing the first full marathon to Monroe, Dirty South Running has an event for everyone at this weekend of fun. Freret 5K & 1/2 Mile (Saturday, October 18th @ 8:00 a.m.) - Benefitting the Junior League of New Orleans, the post race festivities have refreshments provided by Freret Street area businesses. Keeping up with Jones 5K & 1 Mile (Saturday, October 18th @ 8:00 a.m.) - The first in a Back-2-Back weekend of Northshore racing, it's a fun, affordable, family friendly event. Oktoberfest 5K (Saturday, October 18th @ 5:00 p.m.) - Entry to this NOTC race includes free entry into the Oktoberfest Festival all three weekends, plus two free race-day beers from the entire beer garden selection! Wearing lederhosen is encouraged. Gulf Coast Half Marathon & 10 Miler (Sunday, October 19th @ 7:00 a.m.) - The fifth anniversary race teamed up with the Jones 5K (above) to make the Back-2-Back challenge. Run both for an extra medal, plus enjoy a great post-race festival presented by Abita beer! Cane Field Classic 4 Miler. 2 Miler & 1 Mile (Saturday, October 25th @ 8:00 a.m.) - Bragging rights for "most dangerous running medal in the world" go to this race, because participants that run all three races receive a Cane Cutter Challenge Machete. 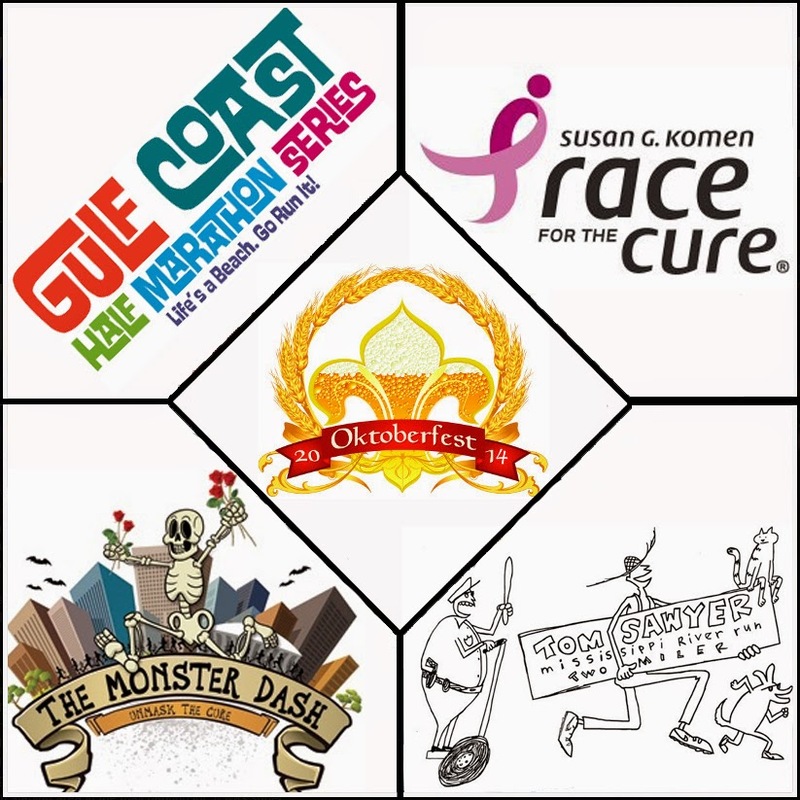 Race for the Cure 5K (Saturday, October 25th @ 8:45 a.m.) - A New Orleans tradition that packs City Park, the 5K fun run and walk rewards the first 1000 finishers with commemorative medallions. Groups of students, coworkers, and survivors honor those who have fought in the battle against breast cancer.